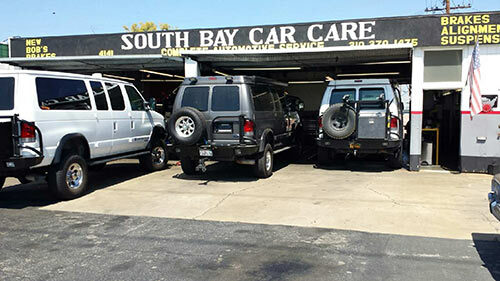 South Bay Car Care has been committed to honest, ethical, and reliable auto repair since 1998. Our experienced technicians help you save valuable time and money by accurately diagnosing issues and recommending preventative maintenance services for your vehicle. Whether your vehicle needs a minor tune-up or major repairs, our full-service auto repair shop can get you back on the road quickly. Our independent auto repair shop in Lawndale is proud to serve our community and our neighbors in Redondo Beach and Torrance. Our priority is complete customer satisfaction. To achieve this goal, we pair high-quality auto repair services with customer service, taking the time to explain the service and answer any of your questions. You can feel confident in your decision to care for your vehicle with South Bay Car Care. Why go to a dealer when you can bring your car to South Bay Car Care? With better customer service and affordable auto repair, our independent auto repair shop is your dealer alternative. Knowledge and experience is backed with continued training. Our technicians stay up-to-date with the latest technology to provide industry leading service for both foreign and domestic vehicles. To learn more about our auto repair services, visit our Lawndale auto repair shop or call us at 310.370.1475. We look forward to meeting you, showing you around the shop, and answering all your auto maintenance questions.